The Times called in at Waveney Playgroup this week to photograph fun activities on offer. Ballymena chemist John Pearson who will be appearing on the popular television show 'Catchphrase'. 1989. Pictured on their arrival at the St Louis Grammar School formal in Tullyglass are Tara and Kieron. 1989. 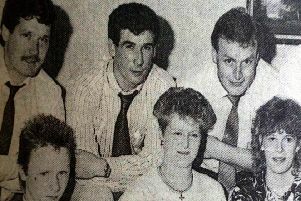 Betty Cahoon School dancers who won prizes at Ballymena Festival, 1989. Prizewinners from the Betty Cahoon School of Dancing at Ballymena Feis - Shannon Nixon and Mairead O'Boyle. 1989.